For some of you, it may be a bug, for others, a fancy long name that seems to have no implication on your system. In the time that it takes for you to read out “Windows Audio Device Graph Isolation” the earth will have traveled a few hundred kilometers around the sun. But, beneath the fancy name, which could also be mistaken for a sentence, lies a host of processes and algorithms, which make your Windows Experience a little simpler. 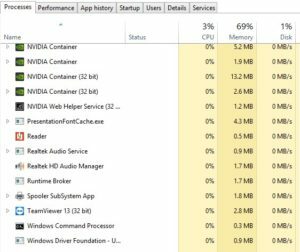 This article will help you fix Windows Audio Device Graph Isolation High CPU Usage Error in Windows 10. 1 What is Windows Audio Device Graph Isolation? 3 Debate: To keep it or not to keep it? 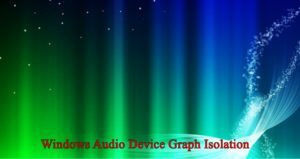 Windows Audio Device Graph Isolation is a process found in Windows 7 and above and is a system which works in isolation from your standard Windows Audio service. Have you ever wondered where the various tracks from Windows 7 feature? This is exactly what is taken care of by the Windows Audio Device Graph Isolation system. For Windows 10, this serves as the primary audio engine. The audio engine basically isolates the 3rd party system sounds from your windows system sounds. Thereby ensuring that Windows system do not drown out the third party audio. This system also provides DRM(Digital Media Rights) for validation, thus ensuring illegal copying. Windows Audio Device Graph Isolation for Windows 8.1 and above also provides a little tool called ‘mixer’. This tool allows the user the ability to control individual sounds. individual sounds can include sounds from applications, hardware, and peripherals. The Windows Audio Device Graph Isolation system is run under the process name audiodg.exe. Third party processes and peripherals have their own sound, and this system isolates the sounds produced by these to create your “mixer” panel, in the audio settings. This provides active control for the user, over which sounds to boost and which to mute out. This process starts upon system boot and can be found frequently on the task manager. This also enables a user to turn off peripheral sounds, and hardware sounds from the OS, a feature that for reason unknown, hardware managers would rather not implement. However, certain companies do enable their own audio, bypassing the Windows Audio Device Graph Isolation processes such as Realtek and Creative. Windows has hardcoded this application to work in the background, and usually will not take precedence over the hardware process. In PCs, however, the infamous PC beep has now been replaced with Windows control. Although deleting the file will not cause system destabilization for your computer, this might have other undesirable effects such as a windows popup sound while you’re glued to your favorite dialog from the Harry Potter series! The process audiodg.exe is included in the system32 folder and can be disabled from Windows accessing the file. It is advisable to keep system files as they are. If you ever type in Windows Audio Device Graph Isolation, your Google search page would yield at least one result that has a title explaining how to fix issues with this system process. Windows Audio Device Graph Isolation has been known to be a system intensive process from time to time. Although it usually shows 0% consumption on your CPU usage. The problem usually lies in a poorly written code for the audio enhancement being used by a 3rd party software or hardware. The problem will usually resolve on its own, with windows isolating the system sound from the 3rd party software. For persistent problems, however, you can always disable sound enhancement for the hardware that you feel might be the suspect. 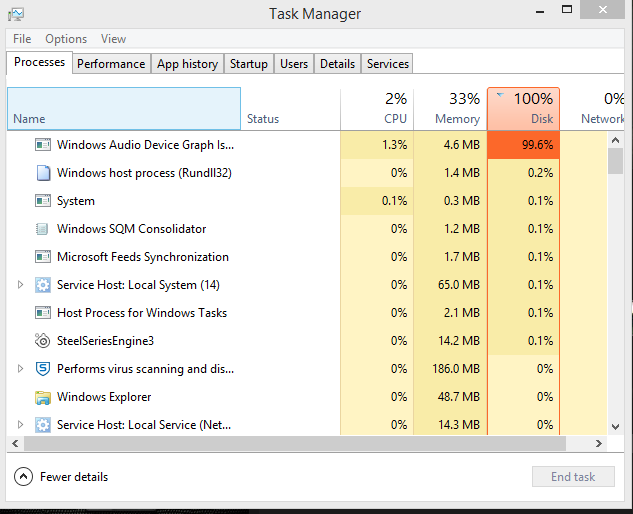 ‘End task’ from the Task Manager could also resolve the issue temporarily. Optionally, a system reboot or a reinstall of the software causing the bug will fix your issue. Software causing the bug is usually a difficult diagnosis and most often is a trial and error effort. However, with the right options, this can be ironed out. The most usual suspects which interfere are Microsoft proprietary software or software accessing your system32 folder. As comes with all .exe files, a malware or Trojan might be lurking behind the .exe file. Masquerading, until your system starts to develop symptoms and you end up losing your precious vacation pictures from Ibiza. To eliminate such a threat, it is always advisable to keep your antivirus and antimalware programs up to date. As long as this is a system file, it is most likely not a virus. However, if you do suspect it to be a virus, run your antivirus, and report suspicious activity to Microsoft. Windows Audio Graph Device Isolation is a nifty little tool that improves your Windows experience. Gone are the days of XP startup sounds, and ear-blasting ping with every popup error. Diminishing privacy and a corporate controlled market is an urgent concern in the 21st Century. We should be thankful to Microsoft for letting us memorize and enjoy our favorite Movie dialogs without Windows system alerts ruining the climax! Debate: To keep it or not to keep it? Windows Audio Device Graph Isolation is not a bug as many seem to report. It is a Microsoft product, put deliberately to enhance user experience. Dedicated sound cards have become standard on most devices, if not all, and Microsoft has developed a method to keep hardware manufacturers under one roof. As it goes with most Microsoft products, however, Windows Audio Device Graph Isolation often develops a mind of its own. To keep or not to keep is the choice of a user. As long as your hardware performs well and fine, there is no harm in a background process which is not system intensive. But if you start noticing spikes more often than comfortable, it is time to remove the program. Always remember, all system files are designed to help out a user. Deleting this might not be deprecating for your system, but additional user experience may suffer. With all said and done, if Windows Audio Device Graph Isolation produces spikes in spite of the fixes mentioned in the article, feel free to drop a comment below!